Life can’t get simpler than this. Push button starters – also known as the keyless ignition system – allows you to fire up your engine without the need of a key insertion. It has never been this convenient and simple to start your car. With this system in your car, you don’t have to worry about losing your keys or creating a mess to find them in case they get misplaced. Push buttons starters are one of the hottest amenities in new cars and are widely being appreciated by drivers. This feature is now offered in more than half of new car models on the market. How does the Keyless Push Button Starter Work? 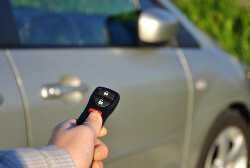 To get the motor running, all you need to do is approach your car with the key fob in your handbag, hand or pocket. A key fob is a security hardware device with built-in authentication, which is identified and recognized only by the system installed in this car. Recognizing the key fob, the doors of the car unlock automatically. Sit in the car, depress the brake pedal and simultaneously push the start button to start the car. Shutting down the engine is also hassle-free. It is accomplished by simply pushing the stop button. For the car engine to start the key fob must be inside the vehicle and the brake pedal must first be depressed with the gearshift lever in ‘P’ mode (Park). This system is designed for both convenience and to prevent car break-ins. Today in these cars, the absence of the metal key makes it difficult for would-be thieves to break into your car. It is quite a challenge to unlock the car and start the engine without the car owner’s key fob.